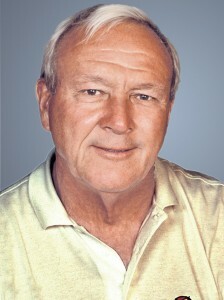 The King is 11 over, today Arnold Palmer turns 83. He has arthritis, survived cancer, lost his wife of more than four decades and plays only occasionally in front of fans but still he is The King. Though he may be on the back nine of life and his golf game isn’t up to the lofty standards to which he formerly played, he is thoroughly loved by fans. He practices or plays almost every day whether at his Bay Hill club in suburban Orlando or the course in Latrobe, Pa. where he grew up and now owns or his other winter venue in Palm Springs, Calif. where his current wife has a home. To give an idea of his magnetism, charisma or whatever you want to call it; a few years ago some visitors from California were driving past the eighteenth tee at Bay Hill as Palmer’s foursome were hitting their tee shots. The Californians screeched to a stop, stuck a camera out the window and gawked (“My God, there’s Arnold Palmer”). After hitting his drive he walked to the edge of the tee box nearest the street and waved so they would have a good picture plus a great memory…I won’t even speculate how many other touring professionals, past or present, would do that. Everyone who’s been writing about golf for a while has a personal story about Palmer and I have several such as an interview session a number of years ago when he was seriously considering no longer playing in the Masters. (He said he would stop any number of times usually following a poor round when the walking scorers no longer showed a number after his name). The occasion of the interview was the inauguration of another of his golf course designs. In this case it was evident he wasn’t very enthusiastic about the course; the routing was hemmed in by large homes and contoured around ponds excavated to satisfy the environmentalists. However, as was his style, he was enthusiastic (cynically, if only about the fee the owners paid him) and put on a mini-clinic while warming up with pithy commentary from his course design partner the late Ed Seay. Then it was off to race around the front nine. There were the obligatory inquiries into his design philosophy and how it was employed on this newest of his creations plus several other equally yawn-provoking exchanges. After a while the conversation turned to the state of his game and his competitive plans. His answers were human and truthful without the use of the royal “we,” the affectation of so many of today’s toursters. I asked a couple of more questions concerning what he was working on to improve his swing and then he gave me the quote which became one of the best leads I ever had. Not only is this a wonderful memory of time spent with Palmer and a pretty good story, it also expresses his love of the game and is one of the reasons fans love him. Maybe next year to commemorate his 84th I’ll tell you another of my Palmer memories…a true one about the men’s room at Bay Hill Club.